1. What kind of righteousness does God require? a) Our very best effort to live a righteous life. b) A perfect righteousness which only He can provide. a) God wants us to know that our old life in Adam ended on the cross. b) God wants us to work on one sin at a time until we are free of all our sins. a) "I am now creating you as a new person in Christ." b) "I want you to try to do better now." a) our perfect example so we can live like Him. a) much better than we were before. 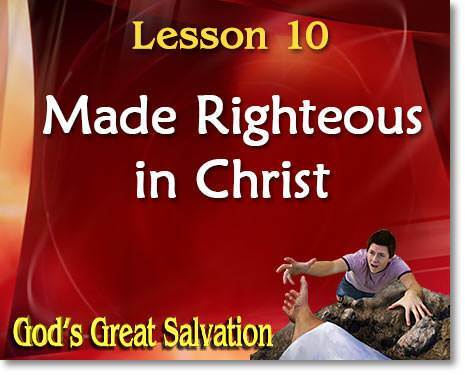 b) the righteousness of God in Christ. a) something we must work for during our whole life as a Christian. b) a gift, and it is ours the moment we take Christ as our Savior. a) depends on how we are living the Christian life. b) is what we are in Christ. a) our conduct—the way we live here on earth. b) our daily physical exercise. a) our walk or conduct here on earth. b) our position in Christ. a) to live, counting on what we are in Christ. b) to believe that God will accept us if we do our very best to live a holy life each day.